Find Rest is a beautiful devotional written by one of my favorite authors, Shaunti Feldhahn. This is a departure from her typical books. Shaunti is a social researcher who has found the common struggle in woman trying to do it all only to find themselves feeling frazzled and frenzied due to the crazy business of life. This 60-day devotional is packed with great insights and encouragement. Through daily devotions, reflection questions and room to journal a little she walks with us to a place for finding rest. Each of the elements is the theme of the daily devotions and definitely help you discover lasting peace in a busy life. Daring to Hope: Finding God’s Goodness in the Broken and Beautiful is an amazing and encouraging read. I was so blessed by Katie Majors’ amazing commitment and obedience to the Lord. As a teenager, Katie went on a mission trip to Uganda which changed her life forever. When she returned to the states her desire to follow the dreams she had before she went we completely gone. She decided to make the move to Uganda permanently rather than to head to college. In Uganda, she started a nonprofit called Amazima Ministries. Her mission is Helping to educate and empower the people of Uganda with God’s love. She is passionate about helping people, in this book she shares how she works with woman and families to find the love of the Lord and improve their lives in any way she can. She is active in fostering orphans, providing lay health care, helping families be united after the death as well as adoption. This book is filled with stories of raising those beautiful girls and the challenges of loving and losing. I was so encouraged and blessed by her open heart and home. She shares how looking for blessings in even the small ways helped to heal her broken heart when one of her girls has to be returned to her mom after 4 years of being hers. The wisdom shared in this book will bless and challenge you as you look to live out your life loving and serving as God has called you to, in your life, right where you are! He lost his parents before the age of 60 and my mom at the age of 65 after 12 years of Alzheimer’s. I went on to tell him to go ahead and see a doctor just to be assured that things are fine. Unfortunately, he was right, there was a problem. 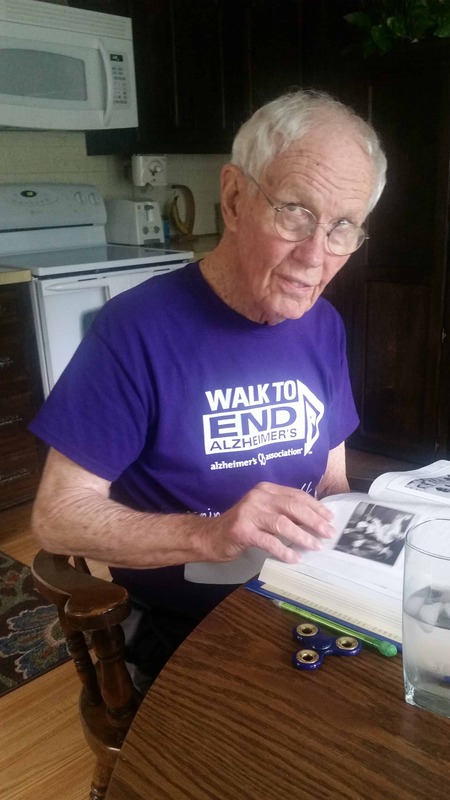 The diagnosis was Mild Cognitive Impairment which later progressed to Alzheimer’s. In some ways, it seems like that was a timeline ago and in other ways it feels like yesterday. As his disease has progressed so has his need for 24-hour care. 3 and half years ago I became one of those who provides that care so that he can stay in his home as he asked. It would be a lot easier if I lived close by but it is 220 miles one way to stay with him and care for him. For the first couple of years, I made the drive weekly but thankfully I have been able to cut back to every other weekend now. As I reflect on this experience of caring for my dad’s needs as he lives with this disease 3 things stood out that I have learned about me. This is not a new revelation but until this experience I think I was doing better at trying not to try to control everything. Now I battle with feeling that I have to control everything to keep him safe. I can see where being a control freak has served me well in some ways. Controlling many of the trivial things in dad’s environment makes life easier and safer for him. It is amazing how something as small as putting his baseball cap on can make him ready to go out the door, no matter what time of day or night it is. Knowing this means the cap is always stored out of site. But my desire to control everything can also bring him and me unnecessary stress. For example, I would love for Dad to go to bed at the same time every night in order to help him get up easier in the morning but how do you tell your 84-year-old person it is bed time? I do it gently but many times that doesn’t matter. Dad has been an adult a long time and he wants to go to bed when he wants to not when I think he should. There are too many other things for me to list that I would like to control and can’t in this situation. When I forget to bring all of them to God then I get STRESSED, sad and upset. Talking to the Lord about how hard the situation is brings comfort unlike anything else. I know God is building my trust in Him through this so I just have to keep focused on Him and reminding myself God does truly control it all. Farmer and I had been married for 5 years when he looked at me and said you need to take care of your dad, even if that means you need to move here and live with him. Seriously, it was his idea. I am so thankful for how well he has loved me as I have spent 50% of the week away from him week in and week out for almost 3 years. No, he is not perfect just like I’m not, but his love and support has meant the world to me. I am also deeply loved by my Lord. His grace to live this day in and day out has blessed me beyond words. His desire for me to love my daddy well has been whispered to me when dad is being difficult. His desire for me to share His light and love with the others who are caring for my dad too has been a mission He has laid on my heart. His love and forgiveness when I have not fulfilled this calling well has been there waiting for the asking. 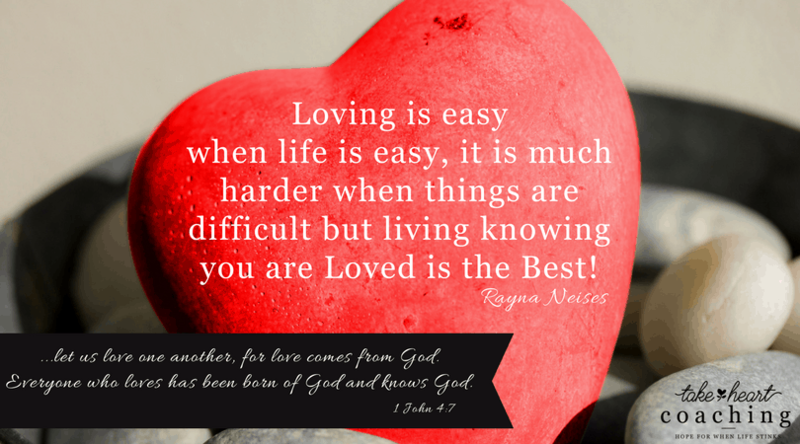 Loving is easy when life is easy, it is much harder when things are difficult but living knowing you are Loved is the Best! I am only human and this hurt. It hurts to see your strong, smart, compassionate and loving daddy fade in and out. I wish that I could figure out a way to serve him without it hurting so much but I am only human and it is supposed to hurt. As a teenager when I experienced losing my mom I closed off my heart for a while. The pain of what was happening just seemed too much. When I finally broke down and allowed the Lord to talk with me about it He said if you feel no pain then you feel no joy either. Rayna, I have both pain and joy for you. Open your heart, I will help you carry the pain and bask in the joy. There are times I feel overwhelmed with the sorrow and pain of watching dad struggle in this confusion and frustration. That is when I realize I have been holding it in and not taking it to my heavenly Father for Him to carry it with me. So, there they are, 3 things that I am learning from taking care of my daddy during this time in our lives. Have you taken time to reflect on the lessons you have learned from your Dad? This weekend might be an appropriate time to do that. Life is not easy and your relationship with your dad might be a tough one but with prayer and reflection I’m sure there are some things you have learned from him. I would love to hear what you have realized you have learned from your dad. Comment below!